We offer a wide range of classes to suit all ages, breeds and ability. Marianne will assess each dog and advise which class will be the best suited. Classes last one hour, unless otherwise stated, and there is a maximum of 6 dogs per class to ensure individual attention. Please bring some treats or a favourite toy with you to class. 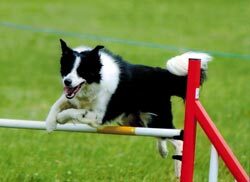 In the Agility class you may be running around so please ensure you wear comfortable footwear, trainers are always good! All our agility lessons are held on grass. Teach your dog to jump, weave and see-saw! The class sizes will be on average 4 - 6 dogs and no previous experience is required. Please call Marianne for confirmation of dates. © Copyright 2018 Patchwork Training. All Rights Reserved.